VALKEE Bright Light Headset For Battling The Seasonal Blues | OhGizmo! 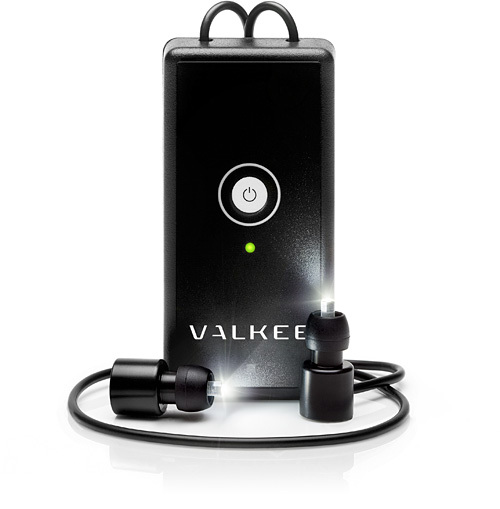 While most bright light treatments for seasonal affective disorder are designed for the eyes, the VALKEE is actually designed to be worn like a pair of earbuds, blasting the light towards your brain via your ear canals. According to their website it targets the brain’s photosensitive areas which can cause depression and mood swings when not receiving enough light, and is apparently more affective than blasting the eyes with light since the ear canal is the thinnest part of your skull. Now I hate to be skeptical about this approach, since it does seem to have a logical advantage. But ~$240 (€185) is a hefty chunk of change for what are essentially in-ear LED flashlights. This is digital homeopathy. The human body has no photoreceptive cells anywhere but the retina, so this is as stupid as it is expensive. My skin cells aren't photoreceptive, but if I expose them to UV light I run the risk of melanoma. Whilst I am skeptical about all things like this I will await the clinical trial results so as to enable me to make an informed decision. Yeah, I'm pretty sure you won't be getting any real double blind placebo controlled study results. The device has been for sale already one year and they keep telling that some great study results are coming soon. And they conducted a totally useless study on the mean time taking 60 people in and asking afterwards “did you feel better as a result?”. Why would they do that if something actually scientific stuff was coming? Why cannot I read the previous study anywhere? It should be more than 1 year old. Oh yeah, all journals have rejected it? Exactly. If there was ANY evidence to support something like this, the manufacturer would be all over it. The fact that they HAVE none means even a casual relationship doesn't exist. Why not get a flashlight in each ear and do the same? Even small led ones.